Like in any other developed town or city in the United States, restaurant owners and managers in quaint, small-town Walpole, Mass., — just 18 miles southwest of Boston — don’t have it easy, often working 60-80 hours or more every week to keep their small, locally-owned businesses surviving in a world of high-profile, high-profit chain restaurants. They wouldn’t want it any other way, however: owning or managing a restaurant has become a passion, a catalyst for pride of small business ownership, and a lifestyle rather than “just a job,” Whether an immigrant, retired military vet looking to reenter the civilian work world, culinary school graduate or career changer all taking the brave business step to live the American dream, these hard-working men and women have become true champions of good, old-fashioned hard work ethic and heroes of the small business concept that ultimately contributes greatly to fueling our country’s economy. Much like the specialty dishes made at Jimmy’s Pizzeria, owner Themis Kalemkeridis has created his own life from scratch. Nearly 25 years after leaving Katerini, Greece, to seek opportunity in America, Kalemkeridis first learned English, then met his the love of his life Athena, and, in 1996, opened Jimmy’s Pizzeria in East Walpole. Jimmy’s has become a staple of the Walpole dining scene, not only because of the food but also the Kalemkeridis‘ dedicated community outreach. 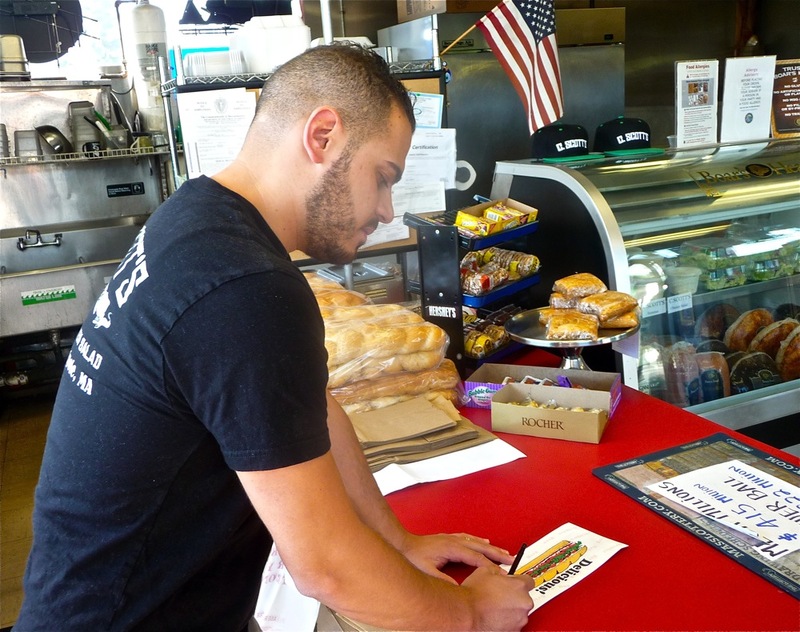 Whether offering his food and time to worthy causes or just simply putting aside work for a moment at the bustling restaurant to make sure friends and neighbors are doing well, Kalemkeridis has clearly shown a daily gratitude to those who have welcomed him to America and helped make his business a success. That strong, close-knit family base gave Kalemkeridis the courage, confidence and ambition to seek opportunity in America. He met, through friends, Athena Exarhopolous, a Medfield High School graduate who studied hotel and restaurant management at the University of Massachusetts Amherst in Amherst, Mass. They soon fell in love, and married in 1996. At that time, Themis and Athena, both sharing a passion for food, looked to open a restaurant, locally. Athena’s parents helped the couple open a restaurant, which turned out to be Jimmy’s Pizzeria. 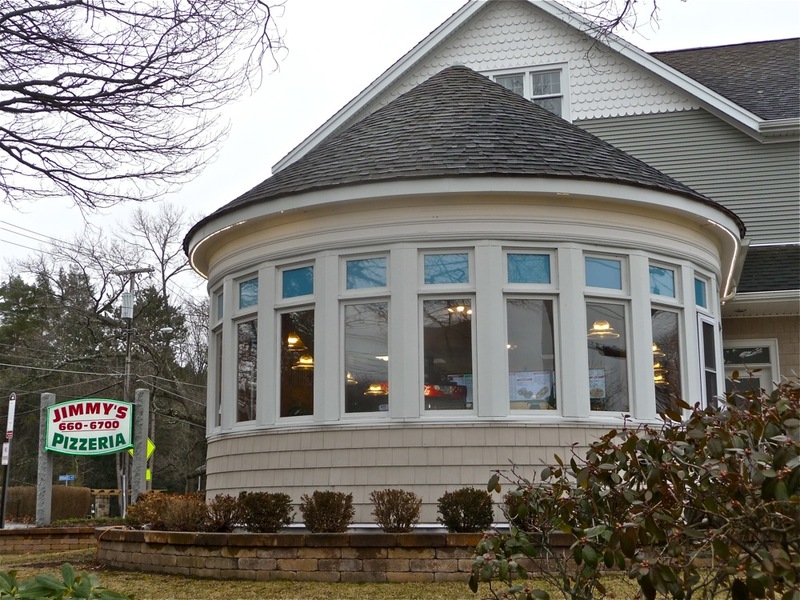 Jimmy’s — named after Athena’s dad, Jimmy Exarhopolous — became a family-run business that initially filled a niche in East Walpole, but soon became well-known across town and with surrounding communities. Themis and Athena loved Walpole so much that they decided to call it home, as well as Jimmy who lives across from the restaurant. The Kalemkeridis have two children, Ellie and Stathis, who attend Walpole High School and have worked at the restaurant. Often, family can be seen either working in the kitchen or stopping by to socialize at a table in the dining room. Additionally, Themis’ parents have traveled to Walpole, including visits to Jimmy’s, every other year for the past 15 years,. “They are so proud,” said Kalemkeridis, of his parents witnessing the life their son has created in America. Kalemkeridis has built a business that stands out from the generic, sometimes brusque “15 minutes, please” type of pizza places. While excellent Greek-style pizzas and tasty, substantial subs dominate the menu, dishes like the gyros and chicken kebob plates, steak tips, chicken cacciatore and ziti alfredo with shrimp and broccoli rival more expensive restaurant offerings. It’s rare to find an inexpensive pizza place like Jimmy’s that offers, as examples, tomatoes that look and taste like they have been picked fresh from the farm, rice pilaf that is consistently cooked correctly, and tomato sauce that has more in common with the North End of Boston than southwest suburban Boston. As a result of this dedication to high quality, Jimmy’s has achieved four-and-a-half star reader ratings, at this writing, from TripAdvisor and Yelp, as well as a five-star rating average from Google reviews. 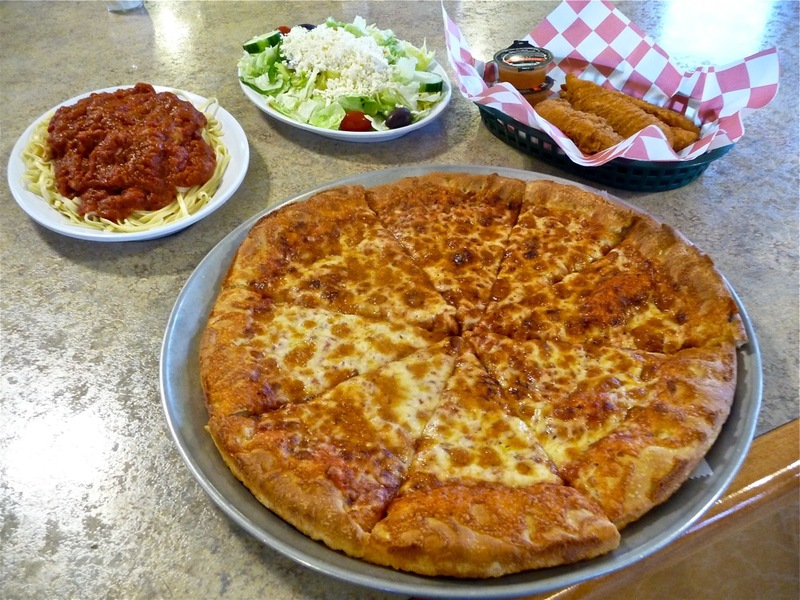 “I have a passion for food,” said Kalemkeridis, who cites his pizzas, subs, chicken parm and salads as personal favorites. “Our effort comes from the heart. Food tastes good if you make it with love.” Athena, with her culinary background, contributes a number of food ideas to Jimmy’s, according to Themis. 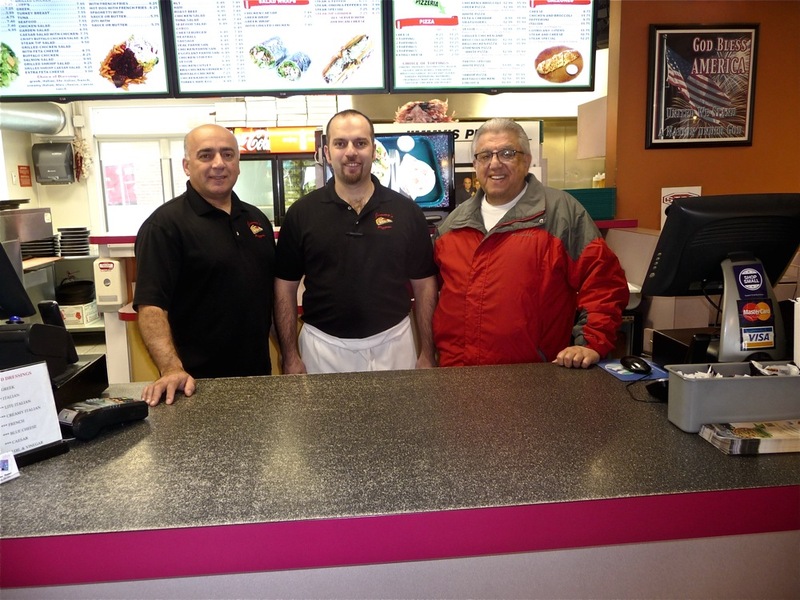 The Kalemkeridis family knows, however, that Jimmy’s is not just about the food but also as a business that quietly but proudly reaches out, whenever possible, to fellow neighbors with its giving spirit. Ann Petrucci, a Walpole resident, knows that first-hand when she and her family went through a personal tragedy many years ago. 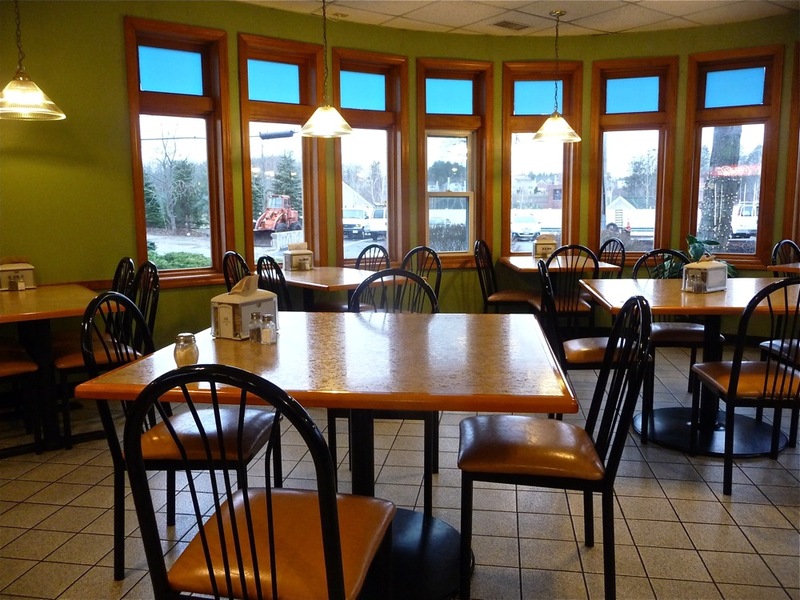 Another well-known element of Jimmy’s is the cleanliness in its pleasant circular dining room with nice picture windows, the kitchen, and the rest of the restaurant. Kalemkeridis typically works more than 70 hours a week, but with boundless energy seemingly built into his DNA that allows him to spend quality time with family and friends when not working. Ultimately, he feels blessed being a family man, proud immigrant, a business owner and a Walpole resident. How not to follow the “Business 101” mode and still wildly succeed: open up an Irish pub in a small town on a rarely traveled side street in the basement of a former foundry building, offer no web site and have little advertising budget. That’s exactly the route Tom Kirwan, 60, took nearly 18 years ago when opening Finnegan’s Wake in Walpole, with no regrets, to this very day. Finnegan’s Wake found its business pot of gold through creating homemade food, fostering a welcoming family-friendly atmosphere, relying on word-of-mouth advertising, and realizing the value of forming lasting friendships and helping out those in need in the Walpole area. Located for many years in downtown Walpole, Finnegan’s Wake recently moved to a new location at 685 Main St in the Rocky’s Ace Hardware shopping plaza after the old building was razed to make way for a new apartment complex. 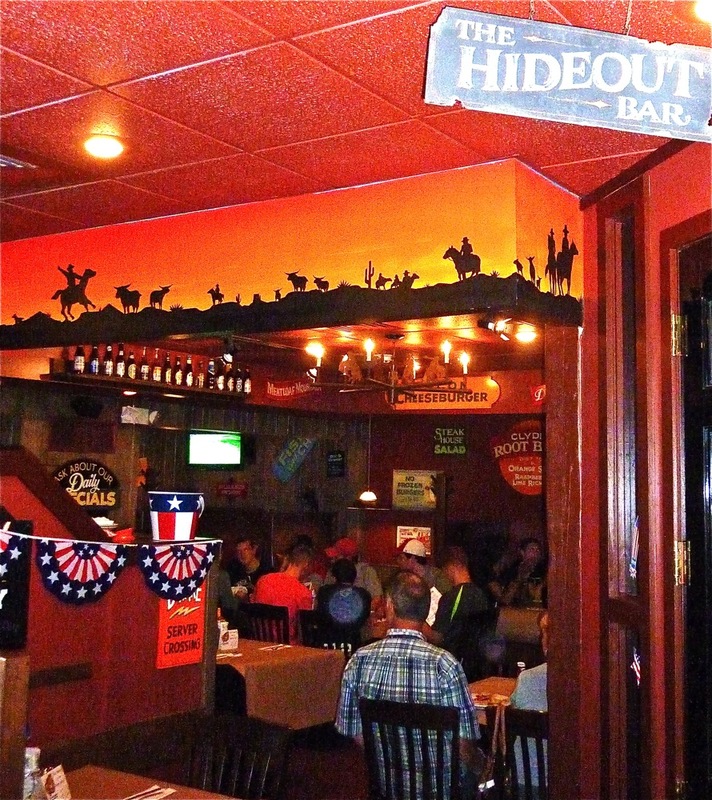 Many people thought that the one-of-a-kind cozy lower-level, “hidden gem” bar and dining room atmosphere could not be duplicated, but, fortunately, the new location is just as welcoming and comfortable — and with all the delicious food intact. The dining and bar space is surprisingly spacious, more logically laid out than the past location and better furnished. The shopping plaza allows for more parking. Also, Finnegan’s will feature a good-sized outdoor dining patio for the warmer seasons. Many years ago, Kirwan had not idea he would own a restaurant so successful and beloved in a small New England town. The 2,900 miles Kirwan traveled from his native Country Cork Ireland in 1986 to eventually owning Finnegan’s Wake in Walpole — the fourth most Irish town in the United States, according to Forbes.com — exemplifies an immigrant’s challenges in a new country that could be overcome through hard work and a belief that anything is possible. Kirwan came from a close-knit family with 10 siblings, attended college for two years majoring in marketing, worked in sales, and then found the economy in Ireland slowing to the point where seeking greater opportunity in the United States seemed like the best option. Setting forth overseas with now wife Kathleen, very little money and ready to live in a hotel room, they initially stayed with a friend in Norwood through a mutual connection before eventually finding an apartment in Walpole. While Kathleen worked as a hairdresser, Kirwan took a nightshift job at Tom Dugdale’s First Sandwich Shop and enjoyed the restaurant industry so much that he bought the former Archie’s Place on Main St. and renamed it Kirwan’s Kitchen – a classic downtown breakfast diner. With a counter, tables, Irish music playing in the background, some Irish-influenced meals, and the personal touch of an always-on-the-premises restaurant owner — and a very pleasant one, at that — Kirwan’s Kitchen became an instant favorite in town. At Kirwan’s Kitchen, Kirwan hired Kristin Smith, a Walpole native and Tri-County Regional Vocational Technical High School graduate, who had worked many years as a waitress. While Kirwan cooked the meals, Smith continued to serve customers in her new job, but ultimately she had visions of something greater. Kirwan learned that The Rebel bar on Glenwood Ave., was for sale, and asked Smith if she would like be a business partner with him at Finnegan’s Wake. She jumped at the opportunity. With former Senator Scott Brown (R-MA) as their real estate lawyer, Kirwan and Smith opened Finnegan’s Wake after about three or four months of renovations including tearing down walls to create more of an open space concept. Finnegan’s Wake found immediate success with its cozy bar, and dining and function room settings and pub fare, but word-of-mouth brought in an increasing amount of customers through the years. Still with no web site, little advertising, and only occasional Facebook posts serving as its social media presence, Kirwan and Smith know that “a build it and they will come” approach succeeds through strong community relationships and turning out made-from-scratch food. And now, the new location brings in even more crowds — a testimony to a community’s faithfulness to small business owners like Tom and Kristin who also happen to create fabulous Irish cuisine and American pub, comfort food favorites, as well as a drinks list that ranks amongst the most impressive in the area. Smith — who lives in Walpole with her husband, Christopher, of 21 years (they have three children Douglas, Andrew and Casey) became a master chef through hard work and an innate creativity. With Finnegan’s Wake’s evolution, Kirwan and Smith never lost sight of what has mattered most to them and the customers — that is, creating a welcoming atmosphere for everyone and focusing on simple homemade foods. 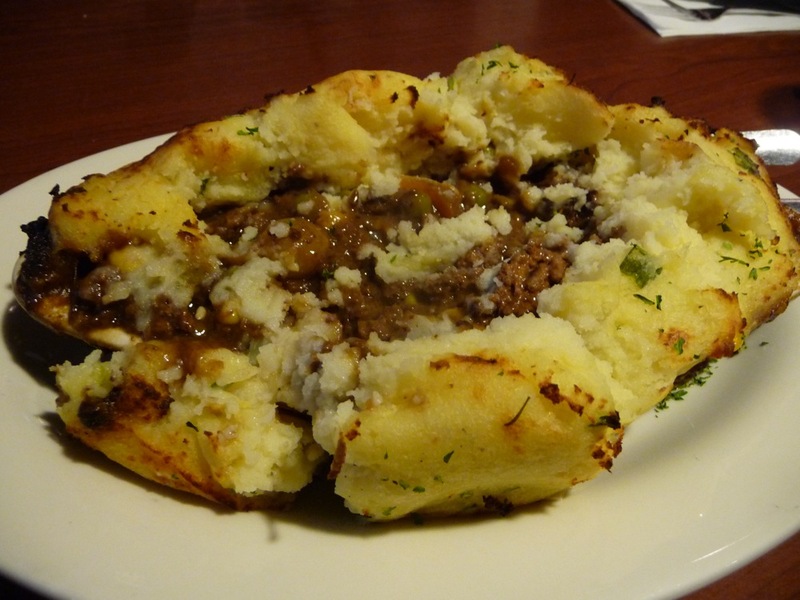 While the menu features general pub cuisine, Finnegan’s continues to feature Irish staples — like the Shepherd’s Pie, Guinness beef stew, bangers and mash (sausage and potatoes), “toasties” (a grilled cheese sandwich on hearty white bread with Irish bacon, cheddar cheese, onions and scallions) and other foods popular in Irish pubs like fish and chips, liver and onions and roast turkey. Cam Bensol and Joanne McCready, both 1958 graduates of Norwood High School, recently ran into each other, by chance, at Finnegan’s Wake, and spoke of the restaurant’s appeal. “Tommy is always here, the soup is great and you always know someone here,” said Bensol. “We find out who we might be able to help through the churches, schools, customers… I started this 15 years ago and glad that it can help,” said Kirwan. Whether operating a restaurant or reaching out to the community, Kirwan has found true success in America. Married 25 years and with three children Colin, Liam and Tommy — Kirwan has found that “Life is Good” goes far beyond just a slogan, and that none of his blessings would have been possible if not for the love of family and community. Kirwan has made such meaningful relationships in Walpole that he brought 25 area residents to Ireland when he and Kathleen were married there many years ago. 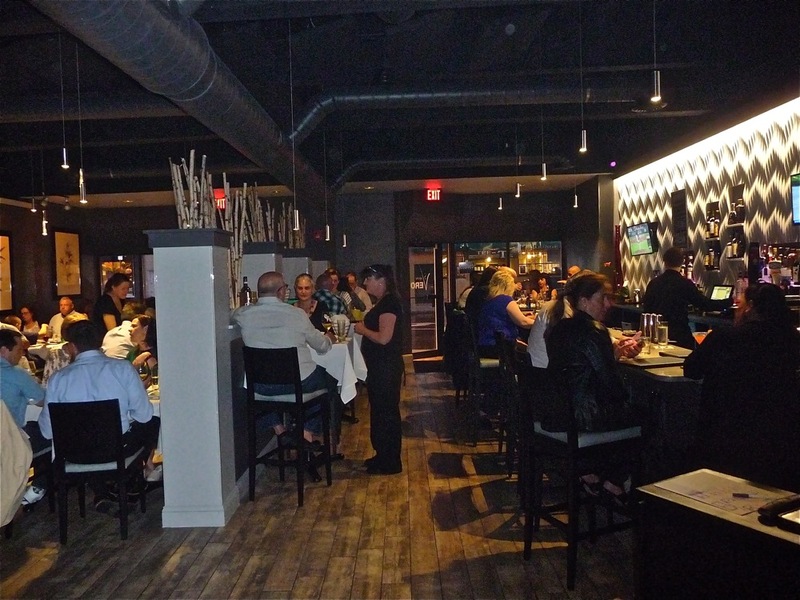 Those looking to experience the true flavors of authentic Italian cuisine typically found in city restaurants no longer have to leave Walpole. Husband and wife Kenny and Yvonne DeFazio opened Sapore Vero in downtown Walpole a few months ago, bringing in crowds from day one. From small dishes to salads to main entrees inspired by Kenny’s passion for Italian cuisine, this is far from your basic pepperoni pizza and deep fried chicken parm fare that one would be hard-pressed to find when in Italy. 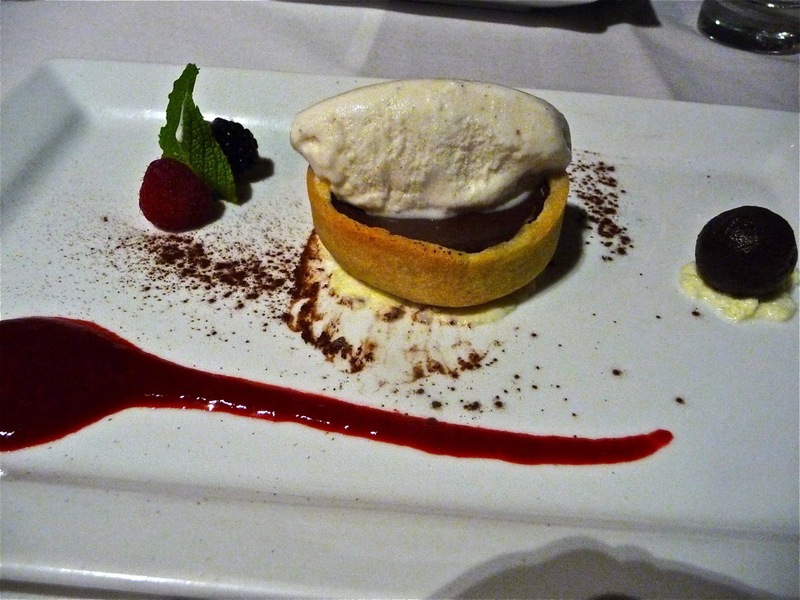 The staff brings a recipe for success to Sapore Vero including Kenny as a classically trained chef with cooking experience in Italy, as well as high end restaurants in the Boston area. Sandro Brito, who has a restaurant background in New York City, contributes as head chef with a strong gift for food presentation. Former Todd English pastry chef Deirdre Melvin (Figs and Bonfire) sweetens the made-from-scratch daily dessert selections with incredible concoctions like the bittersweet chocolate tart with raspberry sauce and vanilla gelato from Cold Fusion Gelato in Walpole. Add Yvonne’s warm, motherly, conversational hosting presence and experienced, personable waitresses like Andrea Mancini and the chance for a special dining night out becomes the main ingredient. Sapore Vero is Italian for “true flavors” which can be found in the small Italian eatery’s fresh meats and produce often sourced locally, as well as the imported seasonings, sauces, cheeses and other elements from Italy. Three days a week, Kenny drives into Boston as part of a work week that spans up to 80 hours to pick out seafood from day boat sources, as well as purchasing the freshest meats elsewhere in the city. Meanwhile, Yvonne also works up to 80 hours a week handling business and administrative tasks, and hosting responsibilities not just at Sapore Vero but also at Mansfield’s Trattoria Della Nonna, which the couple has owned for 17 years. Kenny named the Mansfield restaurant after his Calabrian grandmother (“Nonna” is the Italian word for grandmother) who inspired her grandson to discover a world of creating Calabrese regional cuisine. The menu is limited compared to traditional Italian-American restaurants, but then again, Sapore Vero is not an Italian-American restaurant — it’s purely Italian. The menu, in addition to weekly specials, features mouthwatering items like Prosciutto San Daniele (roasted artichoke, toasted garlic, herbed marinate, provolone), Ribeye Fusilli (shallots, cream, mascarpone, gorgonzola, baby bok choy, crispy crumbs) and Veal Milanese (breaded, slice prosciutto, whipped burrata, red sauce, cappellini, basil oil). Mancini — knowing the wonders of authentic Italian food — worked for many years at the Mansfield location and jumped at the opportunity to work with the DeFazios in Walpole. “I would not work for anyone else,” said Mancini. “My passion for food resonates with this gentleman. I love Walpole and working here! Life has become a bit more complicated since opening their second restaurant, but the DeFazios don’t mind hard work and, in fact, wouldn’t have it any other way. 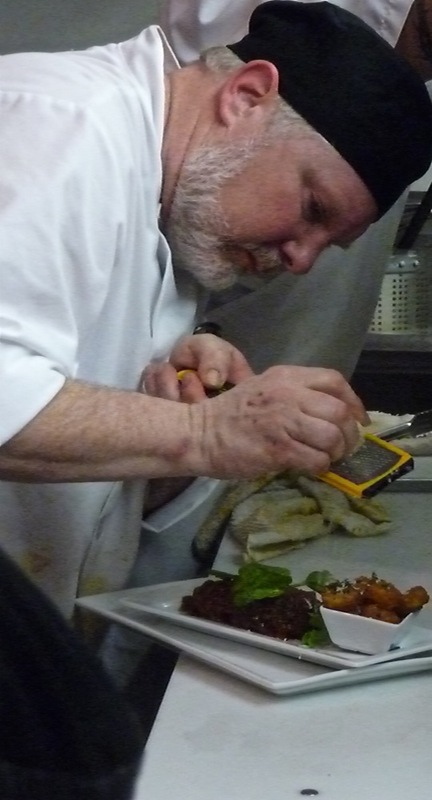 In the Sapore Vero kitchen, Kenny — humble, modest, genuine and unassuming in nature — works intensely with the precision of a fine artist, getting up virtually microscopically close to the food to put finishing touches on his culinary masterpieces. On one visit, waitresses had to wait at the cooking area while Kenny and Sandro sought perfection with the dishes they created before allowing food to be brought to the customers. It’s not that the wait time was that long, but the additional 30 to 60 or so seconds further benefitted the customers’ meal experiences. Within 15 minutes, the word “great” was used by several customers to describe their meals to the waitstaff and owners. Kenny and Yvonne do their best to stay true to form when it comes to Italian cooking. As an example, the DeFazios do not use black pepper, unless requested, as this spice is not used in real Italian cuisine, according to Yvonne. Rather, Yvonne grows 70 plants of a strand of red pepper (which Kenny brought home from Italy) yearly that she cultivates for use in Sapore Vero’s dishes. They have put a lot of effort into the restaurant’s atmosphere, too, with a casual yet intimate ambiance with gray tones, tiled floors, white linen tablecloths, high ceilings, a fireplace, and tree branches over a partition cleverly separating the quaint but crowded main dining area from the handsome, bustling full service bar. Soon, he became friends with Roberta Dowling, the school’s chef, director, and owner . He studied hard, applied himself and graduated as a recipient of the prestigious Julia Child Award. Kenny and Yvonne have been married 27 years and truly live a family-oriented lifestyle — from the two children, three grandchildren and one mom in their long-time Mansfield duplex to the “family of customers” at their restaurants. Yvonne estimates that up to 90 percent of customers at the Mansfield location are repeat clientele while Sapore Vero has grown quickly to about 60 percent return dining customers. The Good Food Store and Deli in Walpole has been on a “roll” for 25 years with no signs of being “sandwiched” by the growing number of local competitors. The late George Donaruma lovingly crafted his business from day one, first selling specialty food items and produce, but then transforming the space into a full service deli. George, previously a former international food business specialist, soon found overwhelming local success by fostering the art and science of sandwich making with a foundation of Boar’s Head meats and delicious braided Italian sandwich rolls brought in frequently from a historic north-of-Boston baking company that was once located in the North End of Boston. Unfortunately, George fell ill a few years ago, and died last September. Along with his love for family, The Good Food Store was his life, his passion. Alan, 35, took his Suffolk University bachelors degree in business and many years of working in the logistics field to learn the food business. He has worked at The Good Food Store about 11 years, and like his dad, wouldn’t trade his career for anything else in the business world, at this point. 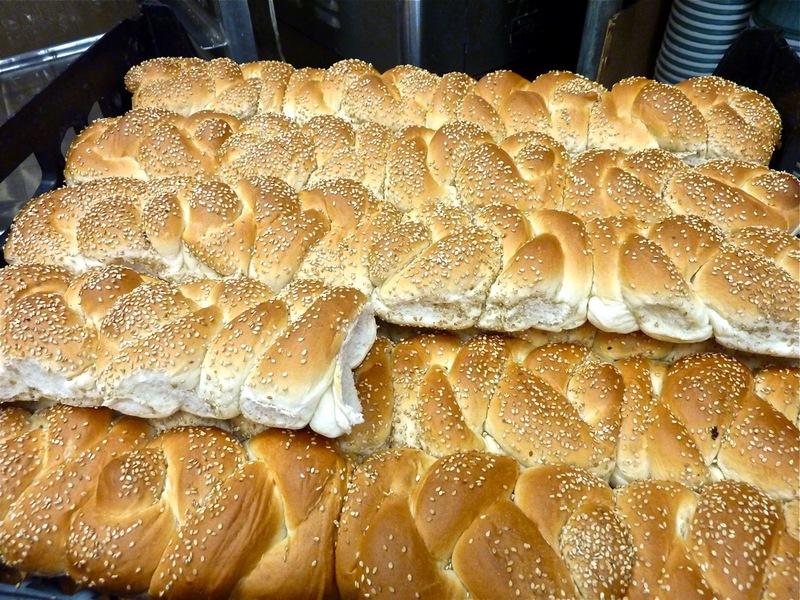 The attention to detail has kept the business thriving as Alan reports about 2,000 sandwiches sold every week. A few of the most popular menu amongst the 20 sandwich items: the “TBLT” (turkey, bacon, lettuce, tomato) and the “Black Jack” (chicken cutlet with bacon and pepper jack cheese topped with lettuce tomato and a chipotle mayo). “We can make them any way you want,” said Alan, who grew up in Walpole before moving to Norwood. In addition to sandwiches, the Good Food Store offers homemade soups, chili, salads, homemade baked goods, fruits cups, “old time candy,” 200 kinds of soft drinks and 150 varieties of chips. Seasonal specials can be found, also, with summer bringing a lobster salad sandwich to the menu. Seating is surprisingly ample for such a small space, and the customers take advantage of it by often filling up the sit-down areas– especially around noon time. During the summertime, outdoor seating provides a quieter, more leisurely setting. 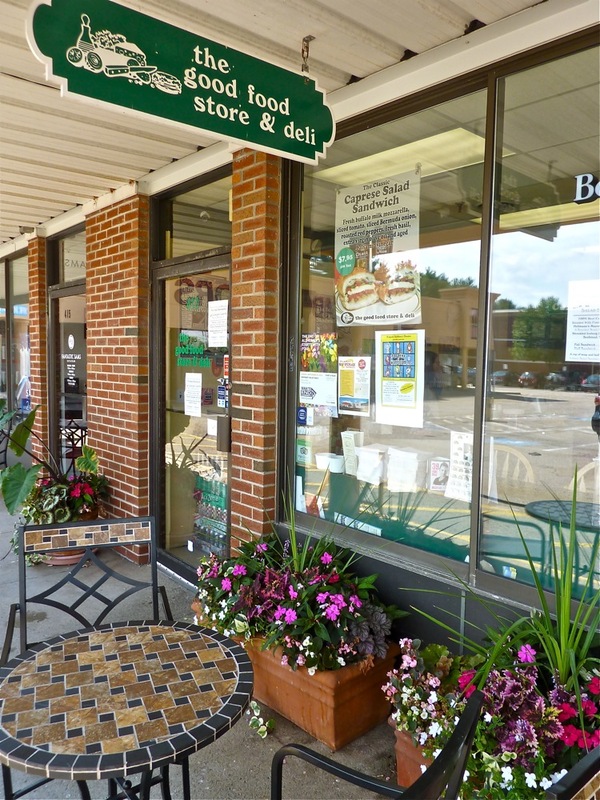 Unlike many other shops, The Good Food Store and Deli does not offer burgers and pizza. When not working — usually Sundays — Alan enjoys quality time with his wife, Bin. Still, there are Sundays he will be working to “order products.” Michelle and staff show that affinity for work, also. The Good Food Store’s commitment to excellence reflect well not only with customers but popular review web sites, too. TripAdvisor ratings average five stars while Yelp feedback comes in at four-and-one-half stars, at this writing. Clyde’s Grill and Bar in Walpole bills itself as “Route 1’s Best Kept Secret,” but that slogan might have to head into the sunset soon at this southwestern-style restaurant. On a Saturday afternoon around 4 p.m., 30-plus people line up to be served in the modestly-sized dining area. Chefs, cooks, waitresses, hosts and other staff go into overdrive to satisfy the crowds, which, within a half hour after the initial rush of customers, sees more diners arriving. Claudio Landim, who has been with the restaurant from virtually the start, begins to speed up his carving of a gargantuan-sized prime rib that has been marinated several hours and looks like some prize-winning food selection out of a Food Network show. Long-time waitress and Walpole resident Ann Ferraro pleasantly takes orders and mingles with seated customers while continuing to carry her kind personality into the kitchen. 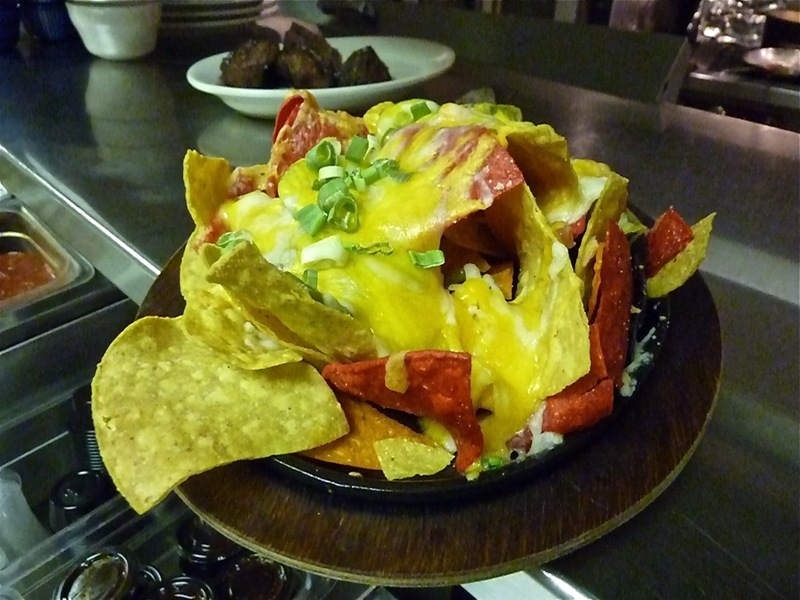 There, she mixes it up with the kitchen help and then brings out a huge plate of nachos to customers in timely fashion. General Manager Mark Fontneau, a retired Army veteran with a crew cut, quick smile, fast pace to his steps and a kind yet firm management style, walks around the lobby and kitchen making sure everything is in order while making humorous quips and words of encouragement to keep staff and customers engaged. Erin Donahue, an incoming senior at Walpole High School, meets and greets customers with a welcoming aura and maturity well beyond her years while Walpole High School junior Aidan Murphy takes on almost a manager’s presence with mature composure — not to mention good handwriting skills as he writes the daily specials on the board. While Clyde’s has been in business for nearly 21 years (owned by Scott White since the start), the latest version appears busier and more committed to food quality than ever. 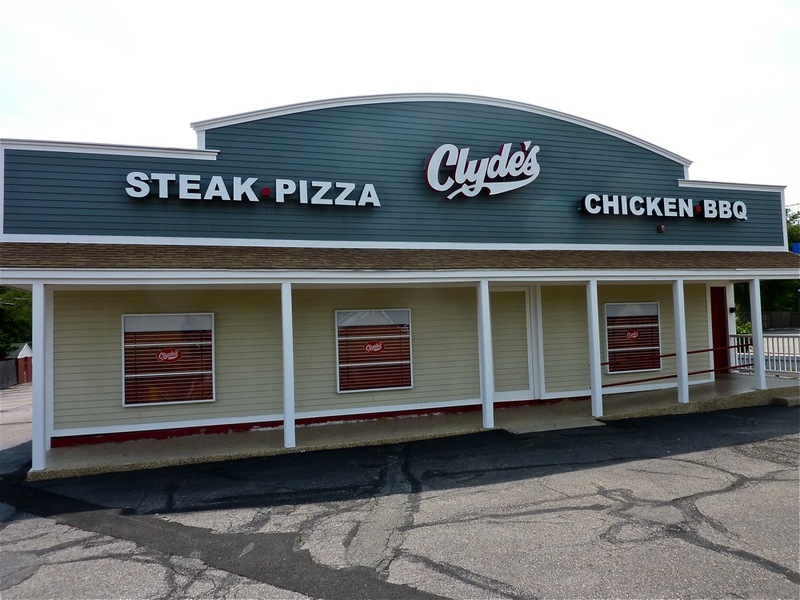 With a renovated exterior and a growing customer base, Clyde’s, it seems, has evolved into the 21st century — a necessary evolution given the corridor of competing restaurants that saturate Route 1 from Dedham to Attleboro. Clyde’s new look and a commitment to continuously improve, as well as innovate new dishes has resulted in a significant recent increase of business. An average of 2,100 guests have eaten at Clyde’s weekly in 2016, as compared to 1,300 last year, according to Graziano. Clyde’s offers a wide variety of food including barbecue cuisine, sandwiches, burgers, Mexican offerings, and a “Southern Comforts & a few other favorites” section that features meatloaf, New England, baked schrod, North Atlantic fish and chips, southern fried chicken, a basket of crispy chicken tenders, and mac and cheese. Healthier options abound including homemade soups, salads, and an under 600-calorie “Waist Watchers” menu with balsamic grilled chicken salad, a Greek Salad wrap, turkey burger, chicken and pico, and barbecue chicken flatbread. 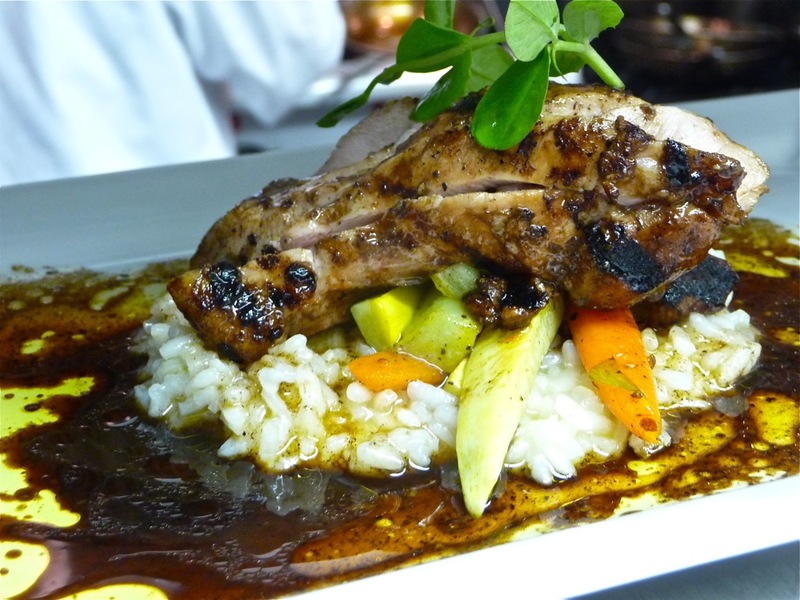 The locally-owned and operated restaurant prides itself on making food from scratch and goes through several hours of preparation on a regular basis to bring out the best food offerings. 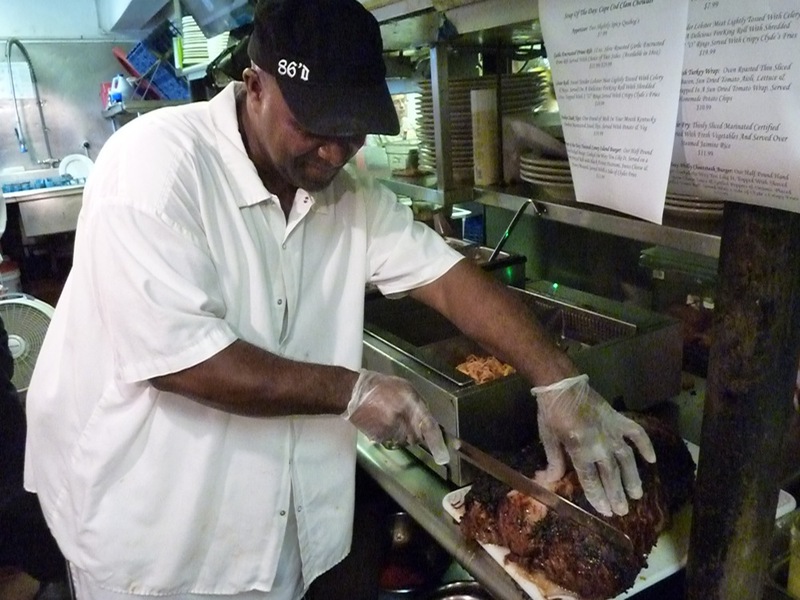 As examples, Clyde’s marinades its beef brisket for more than 15 hours, while the steak tips, pulled pork and baby back beef and pork ribs also go through a long marinading process. Graziano said that Clyde’s also makes their own dough for the pizza menu. Clyde’s also offers a wide variety of burgers, including the mammoth “10 gallon burger” that includes two-and-one-half-pound burger, a pound of fries, a pound of chili and a half pound of veggies. Few finish the meal, but those who do receive the meal for free. For dessert, Clyde’s specializes in a homemade cookie pie that features cookie dough, ice cream and chocolate syrup. Graziano said the outside remodeling job has helped “people take notice more of Clyde’s.” The cleaner, brighter facade helps dispel any misconceptions to those not familiar with Clyde’s that this locally-owned restaurants is more than a bar (although there is a popular, separate bar section with a great drinks selection). Ultimately, Clyde’s has more of a family-friendly appeal. Kids love the horse saddle that they can jump on, and the dining room tables with paper table covers to write on. The staff seems to enjoy Clyde’s environment, too. Fontneau is proud of the overall commitment to excellence at Clyde’s. Clyde’s Grill and Bar is located at the Junction of Rts.1 and 27 in Walpole. Tel. (508) 660-2206. C. Scott’s Beer, Wine and Deli in Walpole proves that you can’t always judge a book by its cover. 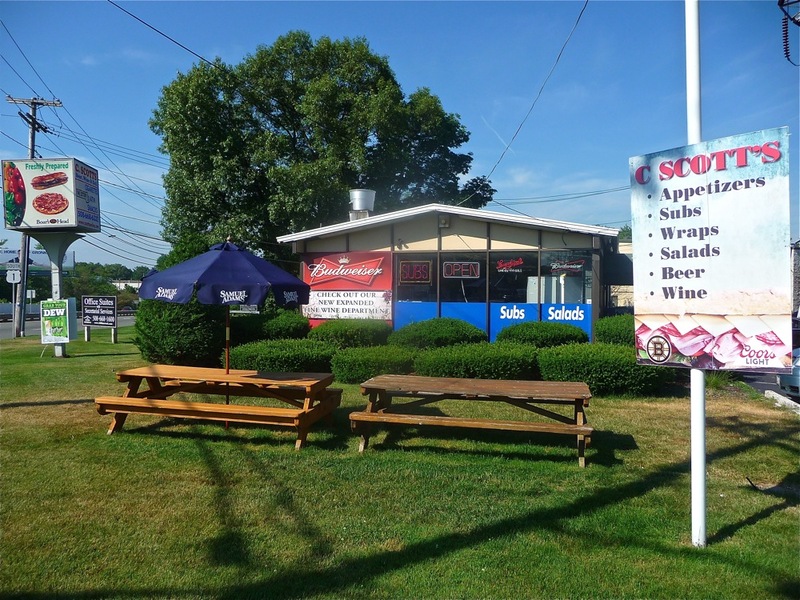 Located under power lines in a small, nondescript building on Route 1, C. Scott’s might be initially mistaken as just another package store with its beer, ATM, lottery and cigarette signs. Upon entering the building, however, that all changes, but only after studying the menu and getting to know the owners. C. Scott’s turns out a surprisingly large variety of high quality food items within a very small kitchen space. 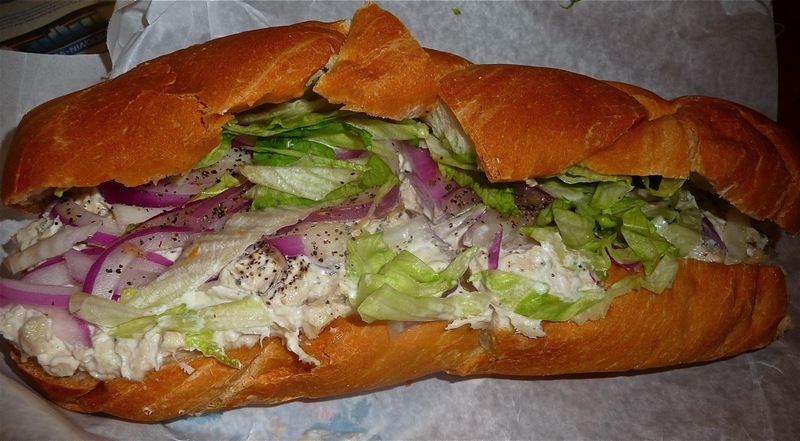 The subs go beyond the norm, especially the “famous” homemade chicken salad — hundreds of pounds are made every week on a daily basis. 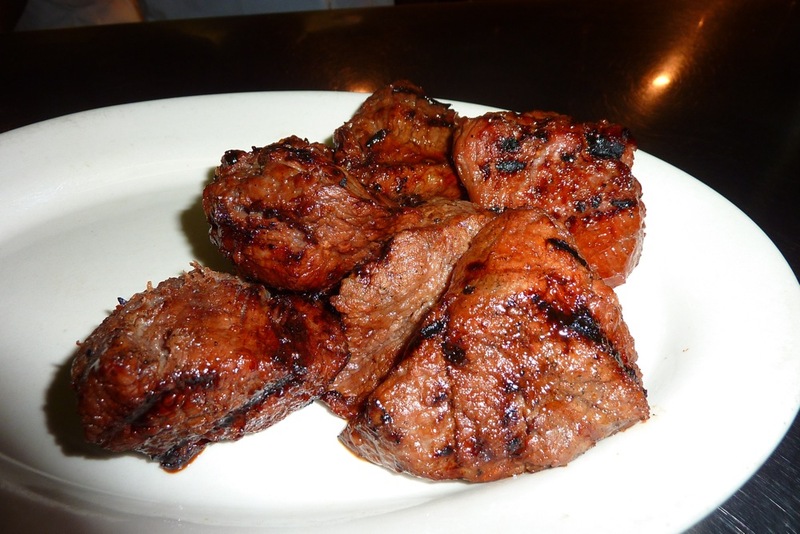 C. Scott’s also serves salads, wings, steak tips, fish and chips and burgers, but takes it a step further with homemade meat and chicken kabobs dinner plates, grape leaves, kafta, hummus and baklava. While C. Scott’s location — about a mile-and-a-half from Gillette Stadium — benefits sales, a steady customer flow can be witnessed on days with no stadium events. Regulars, including New England Patriots cornerback Malcolm Butler, frequent C. Scott’s, with many of the customers not having any need to say what they want — Elias already knows based on their long-standing ordering habits. When customers order, Ibrahim is decidedly “low tech” as he writes everything down on subs bags. In the kitchen, Johnny and long-time chef “Fred” (who worked at C. Scott’s many years before the Ibrihams bought the business –with its original store name intact — about five years ago) work fast and effectively, knowing that serving customers quickly is just as important as offering made-from-scratch foods. Part of that family is New England Patriots owner Robert Kraft, who comes in for the chicken salad “three or four times a season” before game time. A picture of Kraft and the Ibrahim brothers can prominently be seen from behind the counter. “We broil it, clean it and make it daily, not weekly,” said Elias. For Elias, he had no idea that he’d be running a food business when he, his brother and parents emigrated from “North of Lebanon” in 2002. 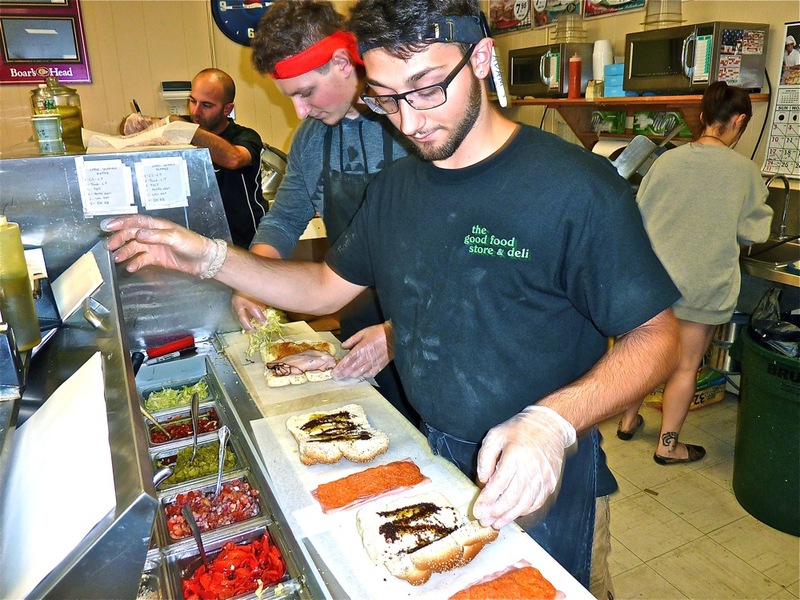 Graduating Norwood High School and then living in Walpole for five years, Elias and Johnny eventually had the opportunity to buy this long-established business — and they never looked back. Living the American Dream by running a business also benefitted Elias in another way: he met his future wife and Walpole native, Kaiti (Tillinghast), at C. Scott’s. The Ibrahims live in Norton and have a two-year-old daughter, Everley, with a son, Leonardo Elias, on the way. Striking a balance between family life and working up to 80 hours a week, Elias said that he wouldn’t have it any other way. Editor’s note: I originally wrote these articles for the Walpole Times (Walpole, Mass. ), part of the excellent WickedLocal newspaper chain. If you enjoyed this story on Walpole restaurants, please share the graphic below on Pinterest. Thanks!